To provide the simplest definition, digital marketing is an umbrella term for the marketing of products or services using digital technologies. Online marketing is by far the most important segment of digital marketing. As traditional channels like TV and radio become less and less valuable, online marketing continues to take up bigger and bigger segments of companies’ marketing budgets, with millions of businesses marketing exclusively via the Internet. Consider this post an introduction to digital marketing—Digital Marketing 101, if you will—which breaks down the most common channels and gives you a comprehensive framework for understanding this ever-evolving industry. One of the things that separates digital from traditional marketing is the capabilities of modern technology. Digital marketers are focused primarily on targeted, measurable activities. They want to zero-in on the “right” audience and measure the results of their efforts. In the past, targeting looked like taking out a regional TV ad or running an ad in a niche magazine, but today’s technology allows for a much more refined, measurable approach. For example, a digital marketer today can run a Facebook advertisement targeting only 20-year-olds interested in the band Coldplay. They can see every view, like, comment, and click and then use a tracking pixel to see exactly what people do after they click on the ad. This data can then be used to create ads that perform better. At its most basic, this process is a simple progression from acquisition to conversion to retention. This model is fairly universal and can be applied to virtually any business. Leads are acquired, converted to customers, and then retained for additional transactions. Unlike traditional marketing which is focused primarily on new customer acquisition, digital marketing is highly active throughout the entire conversion process. Once you’ve acquired new leads, you must continue to market to them in order to convert them into a customers and upsell them on additional products. Since businesses can’t take people through their full sales process on Facebook, Google, etc., the first step for most digital marketers is getting people to visit their website. This is called acquiring “traffic,” and it’s the first step of the conversion funnel we mentioned earlier. These channels offer businesses a scalable way to acquire and increase traffic over an indefinite period of time. Furthermore, they have become so prominent that it would be fairly easy to find a full-time job specific to any one of these categories. Let’s take a closer look at each channel. Search Engine Optimization (SEO) is the process of maximizing the number of visitors to a particular website by ensuring that the site appears high on the search engine results pages (SERPs). 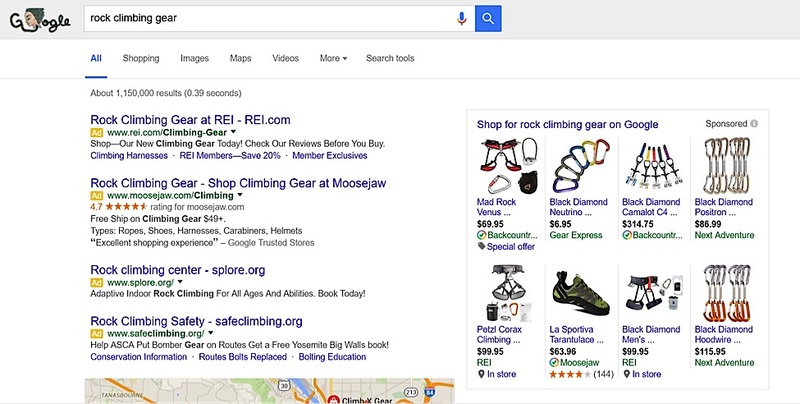 For example, if you wanted to make a rock climbing website appear first on the SERPs when someone searches for “rock climbing gear,” the techniques and processes you use to attempt that would be called SEO. Search engines work by using software applications called “crawler bots” to systematically browse the web and send back information on the millions of browsed pages. This data is then indexed via the search engine’s algorithm in order to provide relevant results when a user searches for a given keyphrase. SEO was one of the first dedicated marketing channels to revolutionize how businesses approached online marketing. Some consider it to be THE first meaningful online marketing channel. In other words, on-page SEO covers everything you can do on your own website to improve search engine visibility. 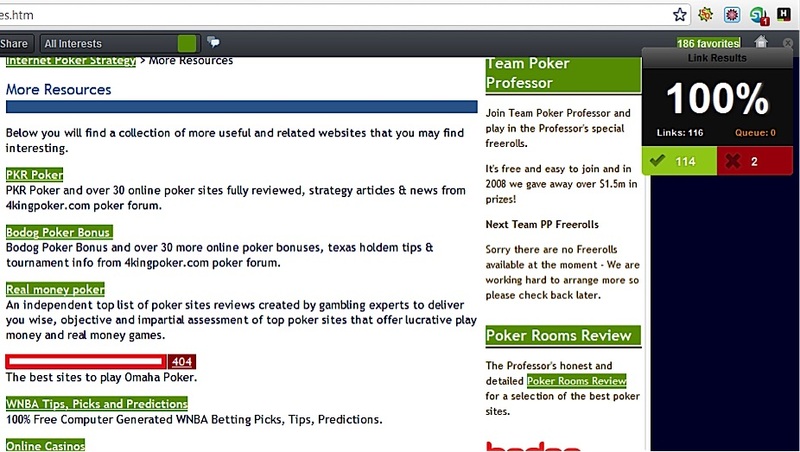 These techniques tune a website’s content and framework to help provide crawler bots with the correct information. Off-page SEO is the practice of optimizing a website’s search engine visibility through off-site backlinks and other external signals. Branding and overall web presence play a role in this equation, but by far the biggest component of off-page SEO is generating backlinks. Part of what made Google’s PageRank so revolutionary was the inclusion of external factors, namely backlinks, into the ranking algorithm. Google’s founders hypothesized that if tons of other websites were linking to a page (called a backlink), it must be a valuable resource and one that search engines users would want to find as well. In the early days, SEO practitioners would game the system by creating thousands of websites for the sole purpose of sending backlinks to the website they wanted to optimize. As Google’s algorithm has evolved, however, the vast majority of these practices have been rendered ineffective, and now backlinks from legitimate, authoritative sites are needed in order to improve search rankings. These techniques (and many others) will increase the number of sites linking to your site, which will improve your site’s prominence in relevant search results. Paid acquisition is any form of advertising or traffic acquisition in which a business pays directly for incoming traffic. With Cost Per Impression (CPM), advertisers pay for ad views, typically in units of 1,000 views, which is where the CPM acronym comes from. CPM stands for “cost per mille” (“mille” is Latin for “thousand”). CPM was traditionally the preferred strategy for getting maximum views at a low cost. However, with the rise of bot traffic (nearly 60% of all web traffic now comes from bots) and the arrival of better performing channels, CPM has fallen out of favor in the digital marketing world. Today, CPM is typically only used in conjunction with other models. It offers a low-cost way to increase brand awareness, and can yield minor results if targeted at the right audiences. With Cost Per Click (CPC), advertisers pay every time their ad is actually clicked on by a viewer. CPC, more commonly referred to as “pay per click (PPC)”, allows for direct ROI tracking, making it the most popular pricing model currently used in online marketing. While a business’ SEO efforts might not be enough to get them on Google’s front page, they could guarantee a front page spot via AdWords if they are willing to pay enough per click. Adwords and other PPC platforms are typically run on a bidding system, where advertisers select a bidding range and the platform dynamically selects ads to display based on a combination of factors including bid price and page relevance. More recently, CPC ads on social networks like Facebook, Twitter, and LinkedIn have begun to gain traction as well, and some have even become the preferred advertising option for certain industries. Cost Per Lead (CPL) typically refers to how much it costs a business to generate or acquire a lead. CPL tends to be used more as a metric for other strategies like PPC, but it can also apply to paid lead acquisition, which is what we are talking about in this section. Paying directly for leads tends to only makes sense in industries where customers spend high amounts per transaction or session. For most businesses, it makes more sense to simply target traffic and set up their own lead capture system to convert traffic into leads and then customers. 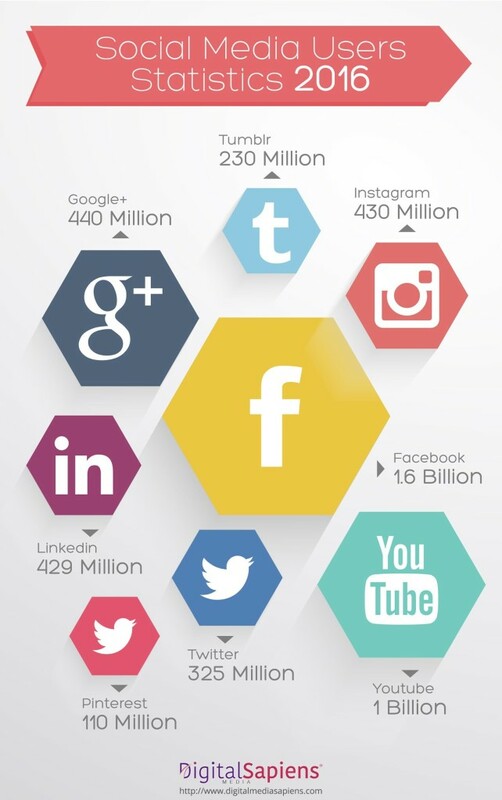 Social media marketing is the process of acquiring attention and website traffic through social media platforms. With the consistently increasing popularity of social media, social media marketing has become one of the quickest ways for new businesses to generate traffic without any monetary expense. As we mentioned before, digital marketing is all about getting a business in front of its target audience. With 65% of US adults now using social media, chances are very high that your target audience can be reached through a social platform. Social media provides businesses with a direct line to their target audience and customer base. By building a social community around their brand and niche, businesses can directly engage and interact with customers on an unprecedented level. 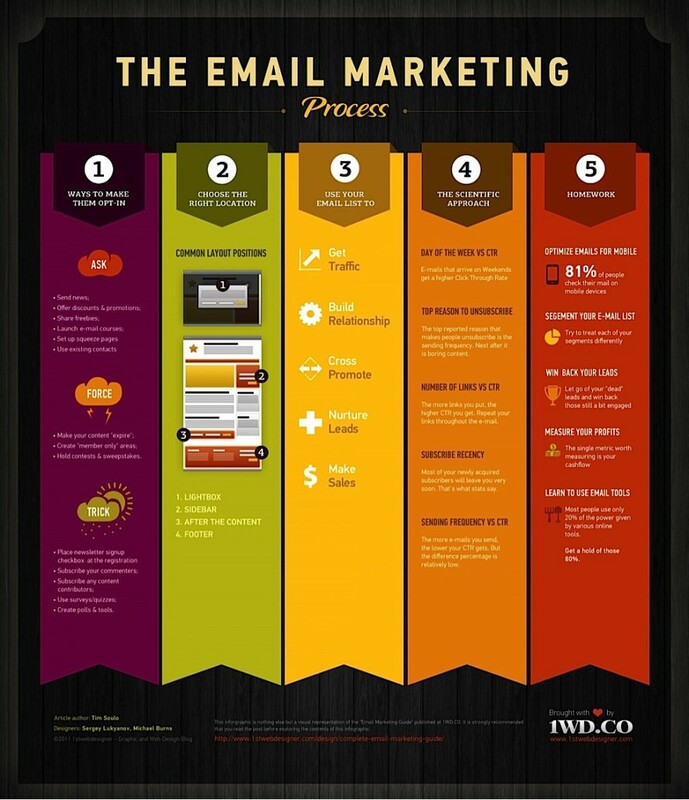 E-mail marketing is the process of sending direct marketing communications to users via e-mail. It is generally considered to have the highest ROI of any digital marketing channel, with an average ROI of $38–42 per dollar spent. While e-mail can be used as a standalone marketing channel, it is often used as a key cog in lead conversion and customer retention, which we will get to later. It is also a mandatory component of the broader acquisition channel known as content marketing. Content marketing is the marketing and business process for creating and distributing relevant and valuable content to attract, acquire, and engage a clearly defined and understood target audience—with the objective of driving profitable customer action. In other words, content marketing is all about creating and promoting content that is really attractive to the audience you want to sell to. Content marketing has gained popularity as Google’s algorithms have become more advanced. Whereas in the past it was more efficient to game the system with spammy SEO practices, nowadays, top-quality content is required to have any sort of SEO success. 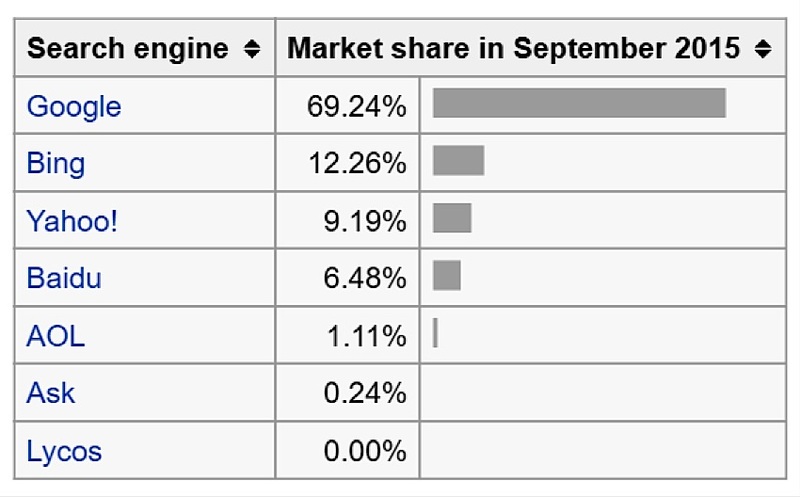 Indeed, quality content has become a crucial component of virtually every acquisition channel listed here. But ultimately, more and more businesses are moving past simply using content in other strategies and approaching “content marketing” as an intentional digital marketing strategy built around the creation and promotion of exceptional (or 10x) content. Influencer marketing is the process of targeting key influencers in a given niche with the goal of getting your business in front of their audience. As the Internet has grown and evolved, more and more individuals, blogs, organizations, and businesses have built audiences large enough to qualify them as “influencers.” This increasing collection of pre-built audiences has allowed influencer marketing to become a viable acquisition channel for the first time in recent years, and it saw a significant increase in mainstream popularity in 2015. An “influencer” is essentially anyone with a relatively large online following. 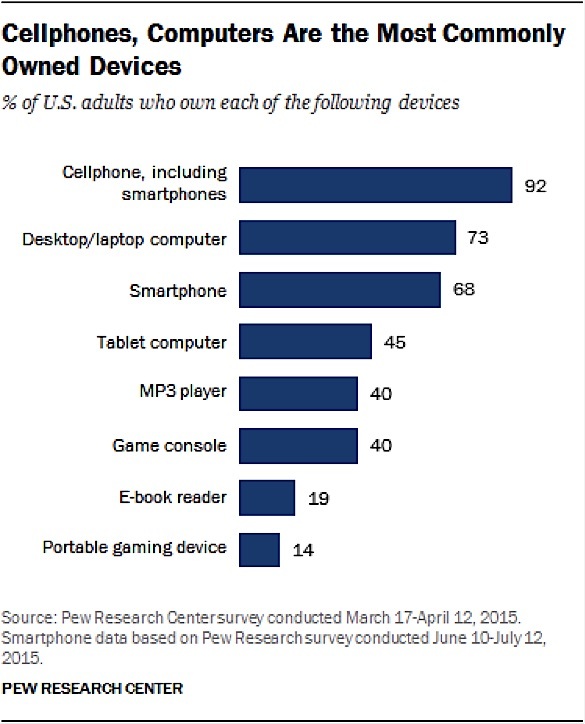 People in each of these categories either own or have direct access to sizable audiences. By targeting them, brands can get their product, service, or content in front of a large audience without having to build that audience themselves. Unlike the other acquisition strategies we’ve covered, influencer marketing is not scalable in the long run. It is, however, an insanely effective “growth hacking” tool for kickstarting early businesses’ growth in a big way. Since most businesses fail in the first year, an effective influencer marketing campaign can be the difference between going belly up and getting the required initial traction to reach profitability. Unlike other acquisition strategies, there are really no cut-and-paste methods for connecting with high-level influencers. You are dealing with people who get contacted constantly, so connecting with them is often more of an art than a science. In some cases, the intended action is a purchase. In this case, visitors are “converting” by purchasing a product and the number of “conversions” is identical to the number of sales. Conversion Rate Optimization (CRO) is a systematic approach for increasing the percentage of visitors to a website who take a desired action. CRO utilizes analytics, user feedback, and other insights to help businesses make the most of their existing traffic by defining, refining, and meeting key objectives via their webpages. To put it simply, CRO is the process of maximizing the performance of your website so that more of your visitors do what you want them to do. In order to increase revenue, we can increase any one of these 3 equation variables: traffic, conversion rate, or price. 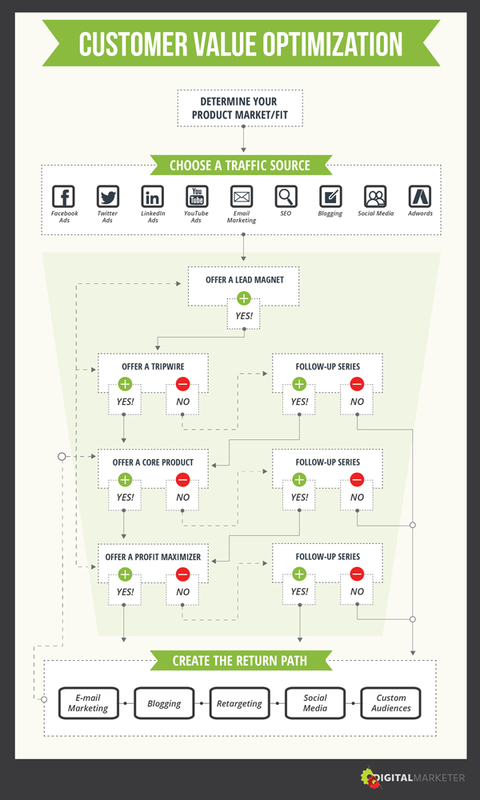 We covered traffic acquisition already so you know that each of those channels entails a cost, whether that cost is money, time or a mixture of both. Scaling up traffic can be expensive, particularly if that traffic isn’t converting once it reaches your site. Increasing price is a possibility, but you probably picked your existing price for a reason and simply increasing isn’t always an option. That leaves your conversion rate. CRO is so important because even just a small increase can have a significant impact on your revenue. If you use a CRO tactic to improve your site’s copywriting and increase conversions from 5% to 7%, you will improve your revenue by 40%, from $500 per day to $700 per day. Conversion Rate Optimization is an important, emerging field with high demand and limited supply. Here’s an example of what CRO can do. 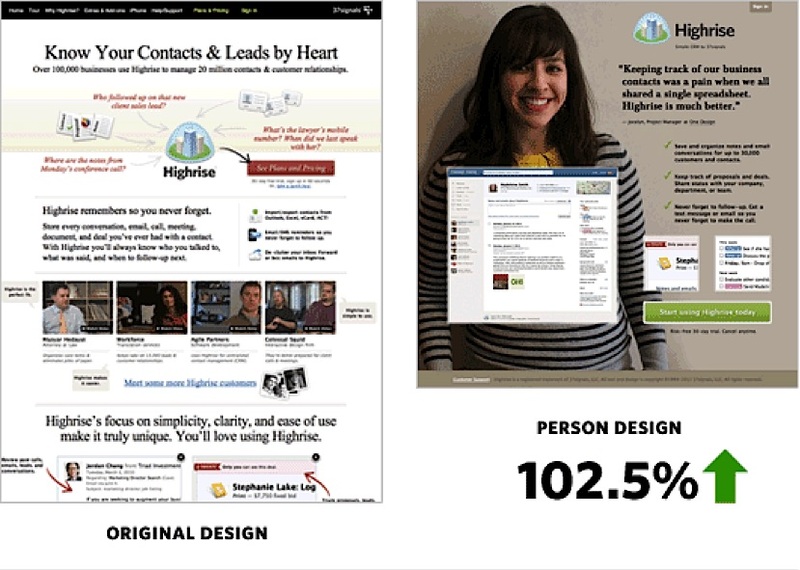 Highrise was able to increase its webpage conversion rate by over 100% (doubled revenue) by changing some important parts of the page. As customers become increasingly educated, they spend a lot more time researching before they are ready to make a purchase. Accordingly, many businesses won’t attempt to make immediate sales. Instead, they will try to acquire “leads” and then nurture those leads into sales via the conversion funnel we mentioned earlier. A “lead” is a visitor who has given you some type of contact information with the expectation that you will be contacting them in the near future. The most common types of leads include people who sign up for an e-mail list, register for a free product version, start a free trial, or call the business for more information. The exact same CRO process we just discussed is used to to convert leads as well as sales. Unlike sales, however, leads don’t always provide you with any immediate revenue. 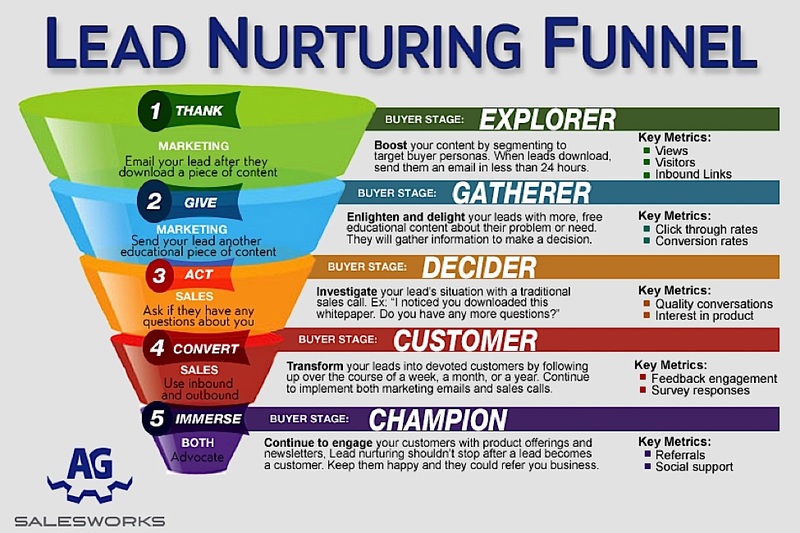 They must then be taken through an advanced process know as Lead Nurturing in order to turn them into customers down the road. Why do so many businesses bother with collecting leads instead of going straight for the sale? 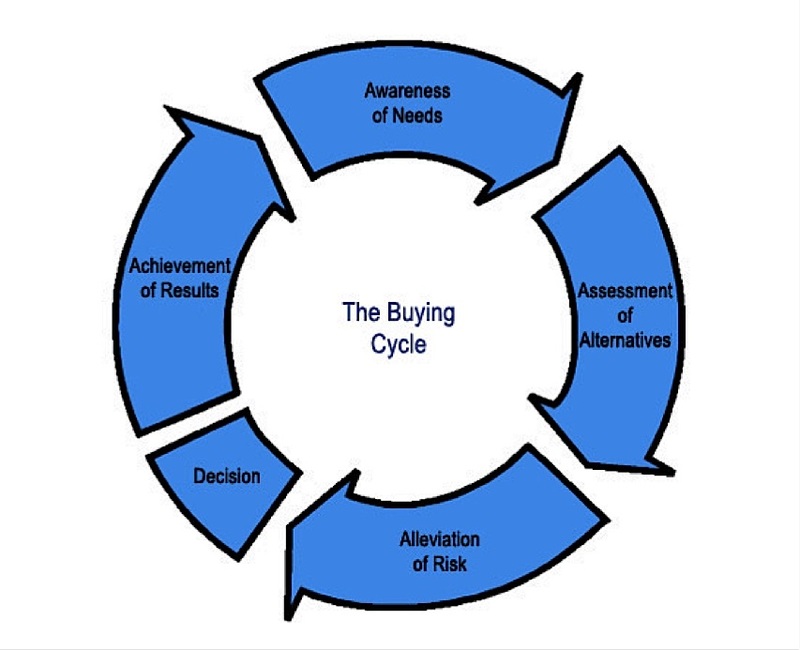 The Customer Purchase Cycle is the process buyers go through when making a purchase. As you will see in the image below, only a small portion of that process is the actual decision-making moment where a purchase is made. If you catch a potential customer in the awareness or assessment phases, you have very little chance of converting them right then and there, and unless your branding makes an unforgettable impact or they are conditioned to remember your brand via other means, they will probably forget all about you as they continue through the cycle. By capturing them as a lead, you can remain in contact with them, build trust/alleviate risk, and keep your brand on their mind so that they are ready to come to YOU when they reach that point of decision. Another reason businesses opt to focus on leads is Customer Lifetime Value. Existing customers are 5x more likely to buy from a business than new prospects, and repeat customers spend 67% more on average than new customers. In other words, when you land a customer, the value of that customer is usually far greater than the initial purchase price. Accordingly, businesses who understand Customer Lifetime Value are willing to invest more in securing new customers. Since new visitors to a website typically convert at around 1–3%, businesses are beginning to pull in a higher conversion rate by collecting e-mail addresses in exchange for intriguing content, tools, or resources, and then using e-mail marketing to nurture those leads into customers. The final step in our digital marketing journey is customer retention, and thanks to our previous discussion of Customer Lifetime Value, you’re already primed and ready to go! As we already mentioned, existing customers are 5x more likely to buy from a business than new prospects, and repeat customers spend 67% more on average than new customers. This means that retaining and retargeting your growing customer base is paramount to building a successful business! Satisfaction is all about delivering on what customers have already bought. Without meeting this goal, nothing else you do will matter. Delivering a fantastic product or service with timely, effective support is the #1 priority of customer retention. This is why modern success stories like Buffer have more than a third of their staff dedicated SOLELY to customer service and support. Happy customers are a great formula for growing a business. Extension is about solving more of your customers’ problems and providing them with additional opportunities to give you money. This could look like upselling them on a more advanced and expensive service plan, offering them supplemental products, or any number of things. If you get into the mindset of extracting money from your customers, you will fail at retention. The key is to find ways to increase the value that you can provide for them, which will make paying additional money an easy choice. 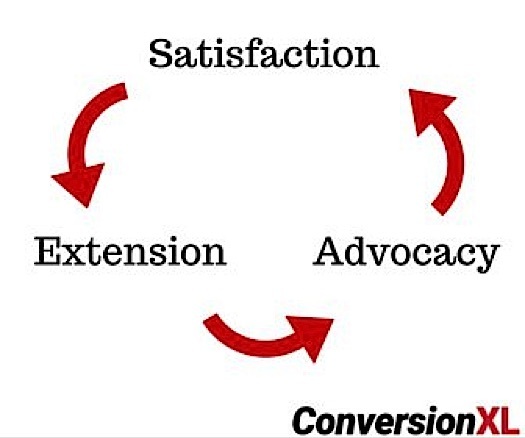 Advocacy is all about turning your regular customers into brand advocates. This is primarily accomplished via referral programs that reward your regulars for bringing new customers into the fold. Customers are most motivated to refer friends and family when the rewards go both ways. Try to set up referral programs that provide a meaningful bonus for the both the referrer and the customer being referred. Short-term retention is focused on connecting users with the value your business provides as quickly as possible. You have a limited amount of time to help them use your product or service to meet their goals. If a customer doesn’t have that “YES!” moment within a relatively short time of using your product, they are susceptible to discounting your product/service and never giving it another try. In addition to a great product/service, intuitive onboarding experience, and fantastic customer support, one of the best ways to impact short-term retention is to create an engaging tutorial or “how to” series that walks new users through the process of learning and actually using your product/service to solve their problems. If you can create an engaging, entertaining tutorial instead of the typical tedious affair, this technique will have a much greater impact on short-term retention. 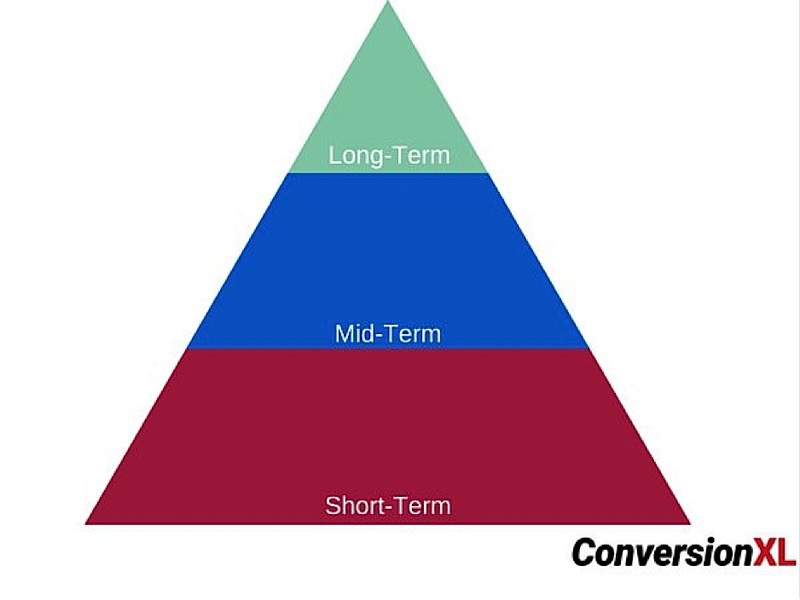 Mid-term retention is focused on turning your product/service into a regular part of your customer’s process or routine. You don’t want people simply using your product occasionally. You want it to be a vital part of their regular activities, if possible. In addition to the basics of customer service and support, the best way to impact mid-term retention is through regular education and training. This could look like an e-mail series, blog posts, videos, etc. The content medium isn’t as import as the content itself. Like the tutorials, try to make all educational content engaging, entertaining, and directly related to your product/service. Long-term retention is focused on following up your initial product/service with a suite of offers that solves many additional problems relating to the initial purchase. You are no longer a product they use. You are now THE brand they go to whenever they need something in this area of their life. To give a basic example of the retention stages in action, let’s go back to our rock climbing example. Short-term retention: Customer bought a beginner’s package of rock climbing gear and absolutely LOVES it! Mid-term retention: Customer is rock climbing more often and using the beginner’s gear she bought from you, as well as a few intermediate pieces, whenever she goes climbing. Long-term retention: Anytime customer want to learn about rock climbing or purchase something related to rock climbing, she visits your site first. Retention and Customer Value Optimization are about maximizing the relationship between a business and its customers. 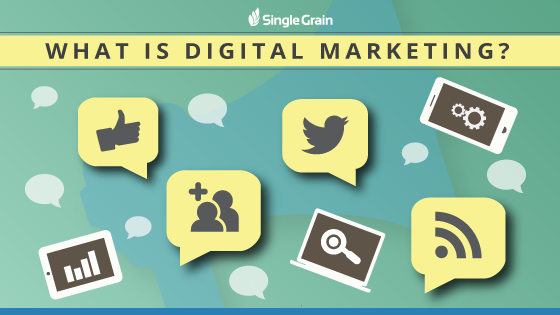 And as you can see in the infographic below, this process can utilize every single element of digital marketing we’ve talked about in this guide. Digital marketing is a general term for the marketing of products or services using digital technologies, especially Internet marketing, and that’s primarily what we’ve covered today. In a digital world, businesses attempt to attract new visitors through acquisition strategies such as SEO and PPC. Visitors can then be converted into leads and ultimately sales through the conversion funnel itself. Finally, businesses seek to retain these buyers as long-term customers through an intentional retention strategy.